The first thing to do is create a couple of folders in your website to store the full-size and thumbnail article images. If your CMS is on a remote web server then you can usually set these permissions using your FTP software. Giving a folder 777 permissions potentially makes the folder’s contents writable by any user on the system. This isn’t usually a problem if you’re running the CMS on your desktop computer, or on a dedicated or VPS server. However, if you’re running your CMS on a shared server then you may want to make your image folders more secure. Ask your web hosting support people for advice on this. Windows servers handle permissions differently to Mac and Linux systems. Again, if you’re unsure how to set up permissions on a Windows web server, speak to your web hosting support or IT people. IMG_TYPE_FULLSIZE defines a constant to represent the “full-size” image type. We’ll use this in the code whenever we want to indicate a full-size image. This value ("fullsize") is also used to locate the full-size images folder (images/articles/fullsize), so if you use a different folder name, you’ll want to update this constant too. IMG_TYPE_THUMB does a similar job to IMG_TYPE_FULLSIZE, but represents the “thumbnail” image type instead. ARTICLE_THUMB_WIDTH defines the width to use for the article thumbnail images, in pixels. Our image-handling code will use this value when generating the thumbnail versions of article images when they’re uploaded. JPEG_QUALITY defines the quality level to use when generating thumbnail versions of JPEG images. The value ranges from 0 to 100, where 100 is the best quality (but largest file size). 85 is a good compromise. This line adds a new field called imageExtension to the articles table. This field stores the filename extension of each article’s uploaded image. For example, if the administrator uploads a PNG image then we’ll store the value ".png" in the imageExtension field. What if you already have articles in your CMS? If you load the above tables.sql file into MySQL then it will delete any existing articles table in your cms database, and recreate the articles table from scratch. This will delete any articles already in your CMS, which is obviously not what you want. To actually create your articles table (or add the new imageExtension field to your existing articles table, as appropriate), you need to load the tables.sql file into MySQL. To do this, follow the procedure described in Applying the changes in my last tutorial. Notice the new imageExtension field inside the articles table. You’ve set up your CMS database so that it’s ready to handle image uploads. Now you can start modifying the CMS code. // Does the Article object have an ID? * @param string The type of image path to retrieve (IMG_TYPE_FULLSIZE or IMG_TYPE_THUMB). Defaults to IMG_TYPE_FULLSIZE. * Inserts the current Article object into the database, and sets its ID property. // Does the Article object already have an ID? * Updates the current Article object in the database. * Deletes the current Article object from the database. This corresponds to the imageExtension field you added to the articles table in Step 3. This property is used to store the filename extension for the article’s full-size and thumbnail images — for example, ".jpg" or ".png". We also modified the constructor method, __construct(), to store the new $imageExtension property value in newly-created Article objects. We’ll call this method from the admin.php script whenever the user uploads a new article image using the article edit form. Its job is to move the uploaded image to the fullsize images folder we created in Step 1, as well as generate a thumbnail version of the image and store it in the thumb folder. The method accepts a single $image parameter. This should be the element in the PHP $_FILES superglobal array that contains all the information about the uploaded image file. Each element in the $_FILES array stores the details of any file uploaded via a particular file upload field in the form. For example, if a submitted form contains two upload fields called "myPhoto" and "anotherPhoto", the $_FILES array will contain two elements: $_FILES['myPhoto'] and $_FILES['anotherPhoto']. Each element is itself an associative array containing information about the uploaded file, such as its filename and its size. Read more about the $_FILES array. The first thing the method does is check that the 'error' element in the $image array equals the constant UPLOAD_ERR_OK. This indicates that the user uploaded an image, and that the upload was successful. If the upload went OK then the method starts to process the uploaded image; otherwise it does nothing. Other possible 'error' values include UPLOAD_ERR_NO_FILE (nothing was uploaded) and UPLOAD_ERR_CANT_WRITE (there was a problem writing the uploaded file to the server’s hard disk). Here’s a full list. Does the Article object have an ID? Assuming the file was uploaded OK, the method then makes sure that the Article object has an ID; in other words, that it has been saved to the database. This is important, because we’re going to rename the image file using the article’s ID in a moment, so that we can easily associate the image with the article. If the article doesn’t have an ID then the method calls trigger_error() to display an error message and exit. Next the method calls the Article::deleteImages() method to delete any existing full-size and thumbnail image files associated with the article. (We’ll write this method in a moment.) We do this in order to keep the image folders clean, without any old, unused article images lying about. For example, if the article currently has a .png image uploaded, and the user uploads a new .jpg image, we want to make sure that the now-unused .png images are deleted from the folders. As you saw earlier, the $imageExtension property needs to store the filename extension of the article image. Here the method uses the strrchr() function to extract the filename extension — that is, everything after (and including) the final dot in the filename — and stores the result in $imageExtension, converted to lowercase with strtolower() for consistency. The 'name' element in the $_FILES['fieldname'] array contains the filename of the uploaded file. Now the method moves the actual uploaded image into the images/articles/fullsize folder. To do this, it first retrieves the path to the uploaded file from the $_FILES['fieldname']['tmp_name'] array element and stores it in $tempFilename. Typically this value is the path to the uploaded file in the server’s temporary folder, such as /tmp/. You can change the temporary folder that PHP uses to store uploaded files by setting the upload_tmp_dir directive. Then the method calls is_uploaded_file() to check that the file in the temporary folder is indeed a file uploaded by PHP. This is a good security precaution to prevent sensitive system files accidentally being made public. Finally, the method calls the move_uploaded_file() function to move the uploaded image from the temporary folder to the images/articles/fullsize folder. This function takes two arguments: the path to the file in the temporary folder, and the path to move the file to. It’s a good idea to use move_uploaded_file() to move uploaded files, since the function performs additional security checks on the file before moving it. To determine the destination path and filename to use, the method calls the Article::getImagePath() method. We’ll look at this method in a moment. The next job for storeUploadedImage() is to create the smaller thumbnail version of the uploaded image. First it calls getimagesize(), paassing in the path to the uploaded image, in order to get the image’s width, height and format (GIF, JPEG or PNG), which it then stores in $imageWidth, $imageHeight and $imageType respectively. Now that the method knows the type of image it’s dealing with, it calls imagecreatefromgif(), imagecreatefromjpeg() or imagecreatefrompng() as appropriate to load the image into an image resource variable, $imageResource, for processing. Now it’s time to create the thumbnail image. To do this, the method first computes the thumbnail height, $thumbHeight, based on the full-size image height ($imageHeight), the full-size image width ($imageWidth), and the desired thumbnail width (ARTICLE_THUMB_WIDTH). Next it calls imagecreatetruecolor() to create a blank image resource for storing the thumbnail image data, passing in the width and height of the image to create. It stores this resource in a $thumbResource variable. Now that the method has created the thumbnail image data and stored it in $thumbResource, it needs to write the new thumbnail image to disk. To do this, it calls imagegif(), imagejpeg() or imagepng(), depending on the image type. It passes in both $thumbResource and the path to use for the thumbnail image. To get the path, it calls the getImagePath() method (which we’ll look at in a moment), passing in our IMG_TYPE_THUMB constant to indicate that we want the path to the thumbnail. For JPEG images, the method also passes a third argument to indicate the JPEG quality level to use. It uses the value of the JPEG_QUALITY constant that we created in Step 2. Finally, since the Article object’s $imageExtension property may well have changed as a result of uploading the image, the method calls $this->update() to update the article record in the database. The deleteImages() method is responsible for clearing out any image files associated with the current article. It’s called by storeUploadedImage() before uploading a new image (as you saw in the previous section). In addition, it’s called if the administrator specifically asks to delete the article’s image and thumbnail via the Edit Article form. Finally, deleteImages() is also called when the article itself needs to be deleted. deleteImages() calls PHP’s glob() function to retrieve a list of all image files in both the images/articles/fullsize and images/articles/thumb folders that are named after the article’s ID. For example, if the article’s ID is 3, the call to glob() will return any image files called "3.gif", "3.jpg" or "3.png". For each filename in the array returned by glob(), the method attempts to delete the file by calling PHP’s unlink() function. If there’s a problem deleting the file then it raises an error and exits. Once all the image files have been deleted, deleteImages() sets the Article object’s $imageExtension property to an empty string ("") to indicate that the article no longer has an uploaded image. The last new method we’ve added to the Article class is getImagePath(), which returns the path to one of the two article images. The method takes a single, optional argument, $type, that indicates whether it should return the path to the full-size image (IMG_TYPE_FULLSIZE, the default), or the thumbnail (IMG_TYPE_THUMB). It then uses the article’s ID, along with the value stored in the article’s $imageExtension property, to compute the path to the image file inside the images/articles/fullsize or images/articles/thumb folder. For example, if getImagePath() is passed IMG_TYPE_THUMB as an argument, the article’s ID is 3, and its $imageExtension property contains ".jpg", then the method will return the value "images/articles/thumb/3.jpg". If either of the article’s $id or $imageExtension properties are empty then getImagePath() simply returns false. The final modifications to Article.php are inside the insert() and update() methods toward the end of the file. As you can see, we’ve modified the SQL INSERT and UPDATE statements to accommodate the new $imageExtension property so that the image extension is stored in the articles table. We’ve also added extra bindValue() calls to pass the property’s value to the SQL statements. We now need to make some changes to admin.php, the back-end admin script, so that it can handle image uploads. Fortunately, we’ve already done most of the hard work in our Article class, so there aren’t many changes that we need to make to this script. We’ve added a single line of code to the newArticle() function to handle image uploads. It checks that the 'image' element exists in the $_FILES array and, if it does exist, it calls the Article object’s storeUploadedImage() method, passing in the $_FILES['image'] element, to store the image and create the thumbnail. As you’ll see in a moment, the file upload field in the Edit Article form is called "image". Therefore we access the information about the uploaded image using the array element called $_FILES['image']. As with newArticle(), we’ve added a line of code that checks for an uploaded image and calls $article->storeUploadedImage() to store it and create the thumbnail. We’ve also added a line of code that checks if the user selected the “delete image” checkbox in the Edit Article form. If they did then we call $article->deleteImages() to delete any existing images associated with the article. Finally, we’ve added a single line of code to the deleteArticle() function that calls $article->deleteImages(). This ensures that any images associated with the article also get deleted. Our database and PHP code can now handle article images, but we need to make some changes both to the front-end templates that visitors see, and the back-end admin templates. Let’s start by altering the front-end templates to display the article images. The homepage.php template displays the site’s home page, including a list of recent articles. We’ll modify this template to display each article’s thumbnail next to the article in the list. Here we’ve added some code inside the “summary” paragraph for each article. The code calls the article’s getImagePath() method, passing in IMG_TYPE_THUMB to indicate that we want the path to the article’s thumbnail. It then stores the path in the $imagePath variable. If this path is a non-false value then the article has a thumbnail image, so the code then constructs a link to view the article, wrapped around an img element that contains the thumbnail’s path. We’ve added an articleImageThumb class to the thumbnail image so that we can style it in the stylesheet. If $imagePath‘s value is false then the article doesn’t have a thumbnail, so no markup is constructed. Since our image paths are relative to the PHP scripts index.php and admin.php, we can also use the image paths as relative image URLs. If you wanted your image URLs to be different to the paths — for example, if you wanted to use URLs that are relative to the site root (such as /images/articles/), and/or paths that are relative to the root of the hard disk volume (for example, /home/me/mywebsite/htdocs/images/articles/) — then you’d need to create an ARTICLE_IMAGE_URL constant in config.php, as well as a corresponding Article::getImageUrl() method. archive.php displays the article archive page — that is, a list of all the articles in the database. We need to modify it in the same way as homepage.php, so that it displays thumbnails next to the article summaries. As you can see, this is the same change that we made to homepage.php. If an article has an image, its thumbnail will now appear next to the article summary in the archive page. The viewArticle.php template displays an individual article page, containing the article’s headline, summary and content. Just as we modified homepage.php and archive.php to display thumbnails next to the article summaries, we also need to enhance viewArticle.php so that it displays the full-size article images in the article pages. This new code works in essentially the same way as the code added to the homepage and archive templates. It calls the article’s getImagePath() method to get the path to the full-size article image. If the path isn’t false then the article has an image, and the code inserts the appropriate img element into the markup. The img element is given an id of articleImageFullsize so that we can style it using CSS. We also add a min-height of 300 pixels to the article content div. This prevents the image overlapping the page footer if the article happens to be very short. For some reason, Safari on the Mac has suffered from a long-standing issue whereby file uploads hang occasionally. (Find out more about this issue here and here.) Since this is quite annoying if you use Safari (as I do), I’ve added this little function that makes an Ajax request to a non-existent URL on the server, forcing Safari to close its connection to the server. This seems to fix the problem. My function is similar to this script, except that my function doesn’t require the Prototype.js library. We’ve added the attribute enctype="multipart/form-data" to the form element. This attribute is required whenever you create a form containing a file upload field. It lets the browser know that it needs to encode the form data as a multipart MIME stream containing different media types (in this case, text and image data). We’ve also attached the closeKeepAlive() function as a submit event handler to the form, so that the function runs when the form is submitted. The next addition to the form displays the full-size image currently associated with the article (if any). As with the front-end templates, the PHP code calls the article’s getImagePath() method to retrieve the image’s path. If an image path was returned, we add an li element to the page containing a field label (“Current Image”), along with an img element linking to the image. We also include another li element containing a deleteImage checkbox. This lets the administrator delete any image(s) currently associated with the article. Last, but by no means least, we add the <input type="file"> upload field that allows the administrator to upload an image for this article. We give it a name attribute of "image", which means that we’re able to access the uploaded file from our PHP code using $_FILES['image'] (see Step 4 earlier in the tutorial). Next we’ll make some additions and changes to our CMS’s stylesheet, style.css, in order to style the article images and thumbnails on the front end, as well as the new elements in the Edit Article form. As you can see, we’ve added various rulesets to style the thumbnails in the homepage and archive pages; the full-size images in article pages; and the “delete image” checkbox, article image and file upload field inside the “Edit Article” form (which you added in Step 7). On line 89, we’ve set the thumbnail width to 120 pixels to match the ARTICLE_THUMB_WIDTH setting in config.php. Similarly, on line 107 we’ve set the width of the full-size images in the article pages to 250 pixels. If you want to use different widths for the thumbnails and images then you need to change these two values, as well as the ARTICLE_THUMB_WIDTH setting. overflow: hidden is a useful trick for situations where you want to clear a float using CSS. Open your browser and visit the base URL of your CMS — for example, http://localhost/cms/. Click the Site Admin link in the footer, and log in. Click an article in the All Articles list, or add a new article by clicking the Add a New Article link at the bottom of the page. In the New Article / Edit Article form, click the button next to the New Image label at the bottom of the form. Choose a file to upload, then click Save Changes to save your article edits and upload the image. 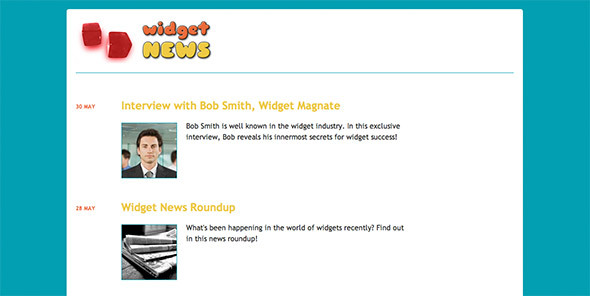 Click the Widget News logo at the top of the page to view the site. You should see thumbnail images next to the articles in the list. If you click the Article Archive link at the bottom of the page then you should also see the thumbnails there. Click a thumbnail (or article headline) to view the full article page, along with the full-size article image. Just to make sure everything works, try editing an article with an image and uploading a new image. This should then replace the previous article image and thumbnail. (Depending on your server and browser setup, you may need to clear your browser’s cache and reload the page to see the new image.) You can also try clicking the Delete checkbox to remove an existing image from an article. You can also try out the demo on our server too! The demo is read-only, so you can’t upload or delete images, but you can see how the images look on the front-end, as well as in the back-end article edit form. Tweaked the stylesheet, style.css, to style the article images and thumbnails, as well as the article edit form elements. You are the Number ONE. !!!!!! Let me say, a Comment Sytem Would be Great too. Thank you for your tutorial as it has helped me develop my PHP OOP style programming skills a lot. @hannz: Any chance you could do a small tutorial on how to implement comments, if you ever have the time? @MarcusS: The main reasons were (1) to keep the code size down in the article, and (2) because some people might want to add image uploads without having categories. very nice and clean tutorial about image uploading to CMS. how do i made it so that this cms can upload multiple image? I’m doing my own photography website which needs to display lots of photo..
@cydo: It depends what you mean exactly. Multiple images from the same form? Multiple images attached to a single article? Additional images that aren’t associated with an article? I’m also wondering how to attach multiple images to the same article. I’ve made some changes in the editArticle.php (in the form), so I can add dynamiclly multiple inputs (as many as I want), but I have some trouble to change the storeUploadedImage in Article.php . Maybe you could give me a hint? Hi Matt can you explain how to upload multiple images? And also if possible how to use that to create a gallery page? Thanks!! @LightningPL @eddie: If you want an arbitrary number of images per article then you’ll need to create a separate articleImages table with articleId, filename, and so on, so you can associate each uploaded image with the correct article. You’ll then probably want to add an imageIds array to the Article class to store the images associated with the article. Then mod storeUploadedImage() so that it stores all the uploaded images, creates their records in the articleImages table (and ids in the imageIds array), and saves the Article record. Then you’ll need to modify the “view article” code to handle display of multiple images per article. In short, it’s quite a lot of work! If there’s enough demand, and many people find it useful to associate more than 1 image per article, I may write a tutorial on it at some point. If you just want to include lots of images within an article’s content then you’re probably better off using FTP and adding the image URLs within the content as img tags. First of all (what I’ve forgot to mention earlier) great tutorials, they a a great source of knowleadge and inspiration. creating a folder with the title of the article, where all the images for this article would be stored (if the titleis changed, so will bethe folder name too). Then reading all the files from the folder and printing them on the website? I really appreciate, they are all very helpful, and I’m a big fan of your website and the tutorials. @Matt: I would really like to thank you for all this amazing work. You’re helping us a lot, many thanks!!!! What if i would like to add another table for some news, or some job descriptions? Should i follow the same style? Note that I will not need to have any photo for this other table. I would really appreciate your advice in general terms before starting with the implementation. Again, Thank a lot for this wonderfull work. @LightningPL: Yes, that could work, if you mean reading them automatically – though of course you wouldn’t have any control over exactly where each image appears in the article page. Depends what you want to do really. You could also use the article ID instead of the title for the folder name, which might be easier to work with. @ekaja: Yes, I would probably create separate DB tables and PHP classes for those content types, if they’re sufficiently different from regular articles. You can base them on the original articles table / Article class. For content that is similar to articles, I would instead store them in the articles table and use categories ( http://www.elated.com/articles/add-article-categories-to-your-cms/ ) to distinguish them. matt, first I’d like to thank you for the great tutorials you have given to the community. I have a question relating to the image upload script. I was wondering how to limit the form to except only jpg images and if it will except only the extension jpg or to convert jpeg to jpg. Help on this would be much appreciated as I’ve attempted a few things with no success. It would be nice to be able to notify the admin on submit that the extension used was not an excepted file type and do a header to bring them back to the form to correct it instead of taking them to the list of articles saying your changes have been saved. How to add a category list too? Hi, could you PLEASE make a tutorial on how to upload multiple images to an article? Hi Matt, very great and useful tut. I am wanting to integrate a way to load pages of the CMS data without reloading the page content. Basically I am wondering if it is possible to integrate Ajax calls to avoid reloading of index page on your CMS easily. Thanks in advance! @meTony: Depends how strict you want it to be. You could just compare the filename extension (the Article::storeUploadedImage() method shows how to get this) to the string “.jpg” or “.jpeg”. Obviously this could be faked. Or you can use http://php.net/manual/en/function.getimagesize.php to inspect the image data itself. @jonathanzuniga: I’ll see if I have time. Also see my hints earlier in this thread. Is this the right direction? It seems like it could work but seems like there’s an easier way. @jvt4: Yes that seems like the right idea to me. Matt, great job on the tutorials. I must say I have learned an enormous amount of php over the last few months due to using your CMS as a foundation. However, I am having a bit of an issue when I move everything from my localhost to my mediatemple server. I have fixed a ton of the errors that I had but these two persist. 1) The dates bump one day back every time I add a new post. Also, when I update the post it bumps one day further back. I have changed the timezone to America/Chicago from the php website and have looked at a few of the UNIX time fixes and havent really found anything that worked yet. Here is the code from all of those lines and I am pretty much stuck as to what the problem is sense it works locally but not on the live server. Any ideas on what could be causing this would be much appreciated. 1) Make sure your PHP timezone is the same as the MySQL timezone on the server. 2) The “Cannot modify header information” error is merely a side-effect of the first error being reported. You’ll want to add some debugging to see what glob(SERMON_IMAGE_PATH . “/” . IMG_TYPE_FULLSIZE . “/” . $this->id . “. *”) is actually returning. It should be an array. If it’s not then you’ll get that “Invalid argument supplied” error. My guess is it’s returning FALSE which means there’s a problem accessing the filesystem (eg permissions problem or file not found). I wasn’t sure why this error was popping up. Any solution? They seem to work independently; however, when I use the code from the image uploaded and category, it pops up with errors. Is there any basic solution to help solve the problem I’m having with the above post. The Category and Image upload don’t seem to work together. I kept receiving errors. Thanks for the cms images tutorial, I got the images to upload to the thumbs and full-size okay but not display, can you tell me where I went wrong? Thanks. I like this script, its great working with CMS in afternoon. Is it possible to store the images with the title, like nice_cms_job.jpg ore nive_cms_job.png ? 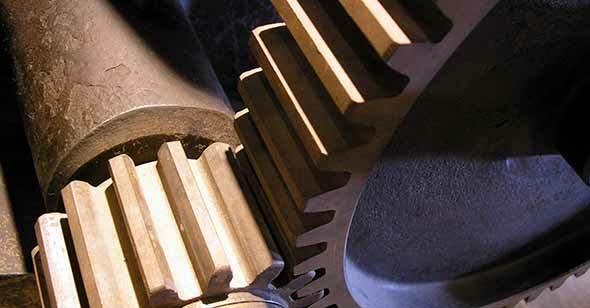 I like the images found by searchmachines, so the name of the image is better found by name thene by id. What a great tutorial, just what I was looking for purely for my own home use, in cataloguing my record collection, however I have tried to alter the homepage.php to display as a table but no matter what I do I cant get it to work properly, for some reason the image will not display, its all but there and I am sure its a very simple fix but I can no longer see the error for looking. this is the homepage.php now it works but not correctly, can anyone help at all. On a local NAS server i have no problem. here is the message (it seems the variables can’t be taken into account). Check the permissions to the tmp folder. Thank you chrishirst fro your answer. I can’t check it as I’m on a shared hosted server and don’t have access to that. I wanted to change the default tmp folder for one I would have chosen with upload_tmp_dir but it keeps using “tmp” by default. Which bypass I could use please ? Chris thanks for your help and support. I would definitely like to make it work on that sort of server. It’s possible to run strong known CMS with same functiunalities on mutualized server so I think it’s possible to do it with Matt’s incredible CMS. I saw that you already answered many times about the possibility of creating a multiupload to associate multiple images (2-3-4-5 etc …) to an article. Saying it was a long process … but if I wanted to upload three images for each item? It would also be a long and difficult, or maybe there’s a simpler way to do it? Thanks in advance for your reply and keep it up! The web improves mainly thanks to you! Thanks for the advice! But I love this “simple” cms! I edited all styles using the bootstrap fremwork. Added 3 fields to insert more data. Thanks in advance to all community! Hi Emanuele, I saw your reply to the topic, would you send me the address of your cms when you’re done so I can see it? I love working with bootstrap framework and read on the reply what you have done with it, thanks. This is great news widget. Please can you help me. How do get the articles to display three in a row? Also How can you specify which article displays on which page? If I add the original insert function, it’s published fine, but i want to use this function because I added new rows to the articles table (publicationDate_fin, title_eng, summary_eng and content_eng). I was trying to fix this about three days but I can’t… What happen? (The admin .php editarticle is changed to get the new forms for each new row in the table, it’s all correct). Says you haven’t selected a file to upload. If you want I can pass the .zip code to mail and the admin address to check it. Any idea how to preserve transparancy when a png (maybe even GIF) with transparant background is uploaded? Or just turning it white instead of black would be an improvement too. I tried a few Stack Overflow solutions but can’t seem to get it fixed. Thanks in advance. EDIT: fixed, edit the following code in the storeUploadedImage-function (see the classes-folder), I’ve copied the first and last line so you can see where it should go. and how do i add the image path to crespond my article. Thank you. In case I want users to login to my system to comment and i want them to be able to upload their profile picture, would you recommend saving the profile picture as part of, let’s say, a USERS table? Also would you recommend saving the admin login as part of the USERS table, with a is_admin field to indicate if it’s an admin user, instead of keeping it as part of config.php? I’d like to know which is more secure way to handle these. Not really, You STILL have to have a username and password in config.php so that the “admin” login details CAN be retrieved from the database. Provided you have changed the password to something that is difficult to ‘break’, and here longer, (ten characters minimum) passwords are better than using a shorter ‘complex’ password of letters and numbers. Having the password in a text file is reasonably secure, as you can block config.php from being requested externally using .htaccess directives and even if someone were to access it, the resulting page would be blank, as PHP only serves content to the user agent that is echo()ed or print()ed to the output stream for the browser to display. So any thing between <?php …. …. and ?> is ‘invisible’ to the outside world. I have this working perfectly locally but not when on a server. I’m getting “Call to undefined function imagecreatefromjpeg” . I am using php 5.1.6 on the server and am stuck with that. Is there a way I can rewrite the method to make it work with the old version of PHP I have to use? Probably nothing to do with the version of PHP as “imagecreatefromjpeg” is actually part of the “GD” (http://php.net/manual/en/book.image.php) library included with PHP but which is often disabled in “shared” hosting configurations. in a php document and request that URL in a browser, if the GD section does not appear you will probably need to ask your hosting provider to enable it, or check in whatever control panel you have to enable or disable there. Now about the multiple image issue. I was wondering if I could just upload multiple images within the editArticle.php page. They don’t have to be associated with the article. I just need them to go to different directories. Then I can just reference them within the wysiwyg. I can’t ftp. Given that the edit article page is for associating the image with an article, you can’t, well no without a fair bit of reinventing anyway. The simplest way would be to take a basic PHP upload form and script such as http://www.w3schools.com/php/php_file_upload.asp and make that the default document ( probably index.php) for a subfolder of the website and by including the config.php and login() check function you could integrate it as if it was part of the site. In a browser and the upload form will be presented. Probably best not to call it “upload” anything though and of course set the “$target_dir” value to a different location, so if the Internet scrotes find it they can’t do too much damage with uploading ‘fake’ images that actually run scripts. And never link to that URL so it will not be exposed to any bots that are scraping the site looking for upload forms. I did do something very similar. I had the image upload as a popup window so the content editor could copy/paste image paths into the wysiwyg editor after they were uploaded. Also you can’t nest forms so that is another reason for the popup. They can upload as many as they want that way. I think the last issue I have would be publishing the articles. What I mean by that is creating static html files from the output of the articles. I appreciate all the feedback you have given. Please add pagination to archive page. It is major demand of every one over here, Thanks. If any body have added, please post the code here or mail me. I will start by saying a very Big thank by sharing this application.this really help me in my PHP learning journey. Please I have problem with this image upload.I have been following the tutorial,and everything was working fine until I get to. File or folder does not exist or permissions are incorrect. I have spent hour looking for a script that will do the things this will – namely upload an image with the news article. This would work for me but I have some concerns of how secure it will be on a shared web hosting.Is there anyway we can make it more secure. It will be just as secure as the permissions are on the server folder structure. I have concerns about folders being 777 and the password in the config file..
Folders should definitely not be that open, at worst only the image folder may need “world write” permissions to allow for uploading. Anyone trying to access the config.php file from ‘outside’ should not see the information as it is only setting values and does not write any data to the output stream with echo(), print() etc. Plus you can block the file from access over HTTP using .htaccess directives. If the image upload folder does require “world write” permissions you should use a folder .htaccess file to block executable scripts and common exploits such as ‘double extension’ files. Change the necessary details and save the file as .htaccess in the images folder. Been having a play around but keep running into the same problem.. Suggests that the MySQL user ‘cmsus’@’localhost’ does not have “SELECT” privilege granted on database ‘CMS”. To display what privileges are granted to that user. The GRANT OPTION privilege should be used with care if anyone else has access to the machine that the CMS is running on regardless of external access, so do not grant this to ANY user for all databases and tables unless you are granting permissions for an secondary ‘root’ user. Have it working now, it did not like the auto generated password. I need to be able to insert paragraph mark-up tags when enter on the key board is hit, in the new article “Article Content” form. As this form I’m typing in now does. I did not make myself very clear in the above post, I think sleep was needed. When the user enters new lines, the new lines don’t appear when they are outputted. Is there any way to make the line breaks stay. How do preserve the line breaks as I’m getting just one long text no formatting. I have tried <pre></pre>but this just mess’s with the page style . You need to convert ‘newline’ characters (ASCII 10) and ‘carriage return’ characters ASCII 13 to HTML line breaks (BR) as the document is being processed server side when it is requested. That’s actually the purpose of the tutorial, it is here for you to improve your coding skills while creating something useful. The intention of publishing it was not for anyone to use ‘as is’ but as a learning tool. That’s fine and I do understand that. But, when the example is trowing up an error and ones understanding of php is not great, a little help is needed. Gives a (T_STRING) error …. so what does YOUR code for calling that function ‘look’ like, because showing the example from the PHP manual is of no help in diagnosing where you may have gone awry. However; a T_STRING error generally means that the PHP interpreter encountered a string of characters where one not expected. eg. variable instead of $variable. The call to nl2br() at it’s simplest should be.